Sturgeon’s law is the adage that “ninety percent of everything is crap”. This represents the belief that in general, most of the work which is produced in any given field is of low quality. This principle is a beneficial rule of thumb, since keeping it in mind can help improve the way in which you assess and consume information, as well as the way in which you decide what projects to work on. As such, in the following article, you will learn more about Sturgeon’s law, see examples of it in various domains, and understand how you can apply it as a helpful guiding principle in many areas of life. Sturgeon’s law is the adage that “ninety percent of everything is crap”. This represents the belief that the majority of works which are produced in any given field, whether they’re in the form of books, films, articles, or anything else, are of low quality. The majority of new books are of low quality, meaning that they aren’t worth reading. The majority of new products are of low quality, meaning that they aren’t worth buying. Of course, though Sturgeon’s law claims that “90% of everything is crap”, it’s difficult to quantify the exact portion of works which are of low quality. This is because, in many cases, it’s difficult to conclusively determine what constitutes “low quality” and what doesn’t. This issue is especially prevalent in cases where the perceived quality of a given work strongly depends on the perspective of the person assessing it. For example, this means that even though there are many books that almost everyone would agree aren’t worth reading, there are quite a few books that some people will think are great while others will think they are terrible, simply because the latter group consists of people who aren’t interested in the topic that those books cover. This is important to remember when considering the applications of Sturgeon’s law, since in many cases, the definition of what is good and what isn’t good is arbitrary, and depends on people’s personal preferences. So far, we saw what Sturgeon’s law is, together with some examples of how it applies in real life. Next, you will see some helpful advice on how you can implement Sturgeon’s law as a consumer, as a critic, and as a creator, followed by some general guidelines on how to use Sturgeon’s law as effectively as possible. Applying Sturgeon’s law as a consumer is beneficial, because it can help you be more efficient in terms of how you spend your time, effort, and money when it comes to things such as consuming information or buying products. In general, a good way to implement Sturgeon’s law is to think of your decision regarding what content to consume or what product to buy as a zero-sum game, where resources that you dedicate to something of subpar quality could instead be directly dedicated to something more worthwhile. Essentially, this means that every moment you waste filling your mind with low-quality information is a moment you could instead spend on something more useful or enjoyable. Furthermore, low-quality information is often going to continue to take up valuable mental space in the long term, and could even end up displacing higher-quality information. If you think about it, you will notice that there are many methods which we already use in an attempt to avoid the lower-quality 90% of the material out there. For example, before buying a book, we will often check the reviews that it has, in order to decide whether it suits our interests, and whether other people believe that it’s worth reading. Search engines, such as Google, are another tool that helps us find high-quality, relevant information that we need. This is crucial, since the internet contains so much information that searches often yield anything from dozens to billions of search results, which we wouldn’t be able to sort through or find on our own. Note that that the nature of the information that you want to consume will vary based on the situation that you’re in. For example, if you just spent a long day at work and you want to unwind, you might want to watch some silly comedy show in order to unwind, and that’s perfectly acceptable. Just because it’s not serious, that doesn’t mean that it’s not high quality and worthwhile. In short, the main take away with regards to applying Sturgeon’s law as a consumer is this: most of what’s out there is low quality, whether we’re talking about books, films, TV shows, articles, products, or apps. Don’t waste resources, such as your time and money, on low-quality stuff. Instead, learn to identify the high-quality things, and focus on them as much as possible. Sturgeon’s law can also be beneficial to keep in mind when you’re playing the role of a critic, since it can help you remember to not waste your time criticizing things that are so subpar that they shouldn’t be taken seriously. For example, in the book “Intuition Pumps and Other Tools for Thinking“, philosopher Daniel Dennett points out to Sturgeon’s law as a reminder to not waste your time looking at the worst works published in a given field, when you can instead spend your time looking at the best, most exemplary works. Furthermore, applying Sturgeon’s law as a critic can also be valuable when it comes to assessing things in a fair manner. This is because it’s important to keep in mind that a large portion of the works in a given field are likely to be low quality regardless of what the field is, so you shouldn’t judge a field based only on the fact that it has some subpar works, just as you shouldn’t focus solely on the weaker aspects of something when criticizing it. Accordingly, the application of Sturgeon’s law in this context can be viewed as an extension of the principle of charity, which entails that you should focus on the stronger aspects of a claim when criticizing it. In short, the main take away with regards to applying Sturgeon’s law as a critic is this: it’s easy to focus on the low-quality aspects of something when criticizing it, but this is often a waste of your time, and is unlikely to lead to a productive dialogue. Therefore, whenever it’s reasonable to do so, try to focus on the stronger aspects of whatever it is you are criticizing, rather than on its weaker aspects. It can also be beneficial to apply Sturgeon’s law if you’re someone who creates content or products, since it can help you figure out what kind of things to focus on in your work. First, by assessing the current market and by seeing how your own work ranks in comparison to existing products, you can determine whether or not what you’re creating is worth your time, and whether it’s worth making it public. In many cases, unless you can create work that is in the top 10%, there is no point to publishing it, since you’ll just be contributing to the noise, by adding to the bottom 90% of works that most people ignore. For example, when it comes to online articles, the vast majority of them aren’t read by more than a handful of people, because most of them just regurgitate the same small amount of often-repeated content that other posts on the topic contain contain. Accordingly, as we saw in the section on applying Sturgeon’s law as a consumer, if you search online for a topic, you will often encounter anything from hundreds to millions of results, but almost none of them are going to get any traffic aside from the few that are featured on the first page of the search engine. There are, of course, exceptions to this, and there can be valid reasons to publish your work even if it won’t be in the top 10% of works that are created in your field. For example, if you feel that publishing your work, even if it’s not great, can be a learning experience for you that will help you improve your abilities in the long term, then you should likely publish it anyway. In addition to this, another way in which understanding Sturgeon’s law can benefit you as a creator is by helping you realize that only a small minority of the work that you produce is going to have a real impact, and that that’s okay. Finally, understanding Sturgeon’s law can also be beneficial when it comes to your learning, since it can help you set realistic goals for yourself. For example, when it comes to improving your writing, Sturgeon’s law can help you understand that a lot of the work that you do is likely going to be low quality, especially at first. As such, when you’re comparing yourself to others, you shouldn’t just compare yourself to the top 10%, since they’re not necessarily representative of the market as a whole (though in general, if you’re going to be successful, they will be your main competition). In short, the main take away with regards to applying Sturgeon’s law as a creator is this: since most of the works and products in the market are low quality, you should focus on creating something that stands out, and you shouldn’t publish something that just contributes to the general noise. As such, you should generally focus on displaying only your best work, unless you’re publishing something as part of your learning experience, in which case it’s entirely acceptable to produce work that isn’t at the top of the market. As with any other philosophical principle, Sturgeon’s law should always be applied with some common sense. Most importantly, you should recognize the fact that Sturgeon’s law is simply a helpful rule of thumb, and should be treated as such, rather than as an absolute truth. The portion of works which is worth your time might sometimes be 10%, but often it will end up being a similar but different number, such as 5% or 20%. As such, instead of trying to quantify Sturgeon’s law using exact metrics, you should instead focus on the underlying concept behind it, which is that only a small minority of the works in any given field are going to be of high quality. In addition, keep in mind that the best works in a certain field aren’t necessarily randomly distributed between different creators. For example, in the case of literature, if only 10% of new books are worth reading, it’s likely that a significant portion of them are written by the same few authors. Furthermore, keep in mind that based on Sturgeon’s law, you can expect 10% of the works to be good. However, out of that 10%, only a small portion will be truly great. The more you can focus on the great works, both in terms of the material that you consume and in terms of the work that you produce, the less you will waste your time on unimportant things. Finally, when using Sturgeon’s law, you should also make sure to not blindly adopt it as a defense for a certain field, or for a certain collection of works. While Sturgeon’s law can be relevant in some cases, you should always mention it in a way that explains why it’s relevant, to avoid relying on fallacious reasoning. Note: if you found the concept of Sturgeon’s law to be beneficial, you should read about the Pareto principle, which is a similar concept that denotes that a small portion of causes are responsible for a large portion of outcomes. Sturgeon’s law was originally called Sturgeon’s revelation, and was proposed by American author Theodore Sturgeon in the 1950’s, as part of his defense of the quality of science fiction books which were being published. Essentially, Sturgeon’s goal in formulating this aphorism was to point out that even if the majority of science fiction writing is bad, that isn’t necessarily something that should be used to attack science fiction as a genre, since the majority of works and products in any field are also bad. As such, Sturgeon proclaimed that science-fiction writing isn’t significantly different from other forms of writing, despite the fact that critics often criticized it more harshly. That is, even though it’s true that most science-fiction writing is bad, this isn’t unexpected, since most of the writing which is published in any genre is bad. 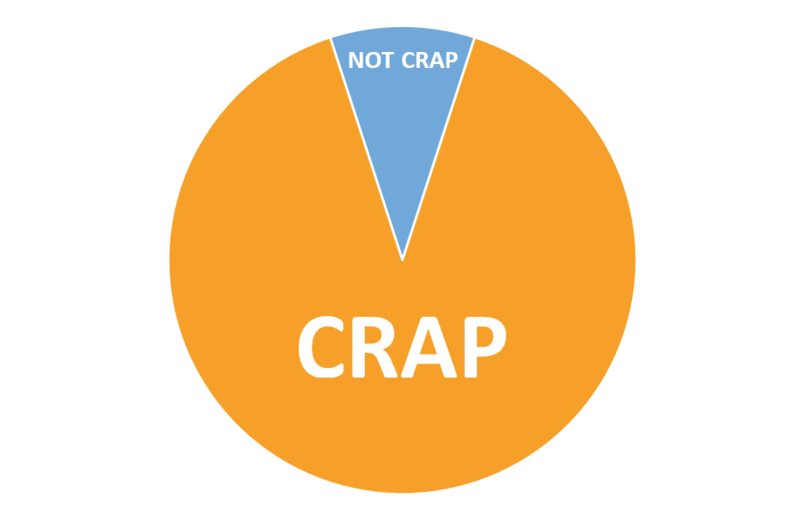 Note: though Sturgeon’s law is most commonly quoted as “90% of everything is crap”, it is often also referenced in various similar forms, such as “90% of everything is crud” or “95% of everything is crap”. Sturgeon’s law is the adage that “ninety percent of everything is crap”, which represents the belief that the majority of works which are produced in any given field are of low quality. Sturgeon’s law extends to various fields and types of works, including everything from books and films to cars and video games. Applying Sturgeon’s law can be beneficial when you play the role of a consumer or a critic, since it can help ensure that you spend your resources, in terms of things such as time, money, and effort, on the works and products that will benefit you the most. Applying Sturgeon’s law can also be beneficial if you’re a creator, since it can help you figure out what to focus on in your work, and since it can help you form a realistic assessment of the market. Two beneficial things to remember when applying Sturgeon’s law are that the distribution of high-quality to low-quality works isn’t necessarily going to be 90%-10%, and that out of the minority of the works that are high quality, there is still a difference between works that are simply good, and those that are great.